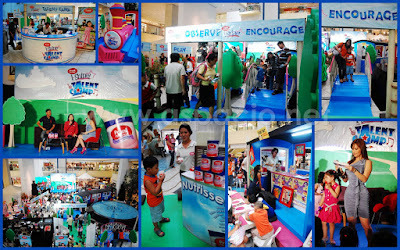 Last Saturday, I took my son to the Promil Pre-School i-Shine Talent Camp held at the EDSA Shangri-La Mall. My son participated in the free workshops offered in the talent camp and below is a collage of some selected pictures. Details of the Promil Pre-school i-Shine Talent Camp can be read below. Every parent wants to see their child become all that he could be. Mothers especially would want to provide basic training, continuous encouragement and full support to their children every step of the way. They believe that in their child lie unlimited possibilities – and that is why Promil Pre-School goes hand in hand with mothers to help children achieve their full potential. As school is about to end, the coming months will be a great time to explore a child’s budding talents. That is why this March, a free workshop called Promil Pre School's i-Shine Talent Camp, will be staged in select malls nationwide, where kids can explore their talents as their moms lend them the needed encouragement and support. As they enter the talent camp, moms and kids will be led to three different interactive areas, each representing the three stages of nurturing a child’s talent: Observe, Play and Encourage. Live performances showcasing outstanding talents, interviews from parents and child experts, and free workshops will be the main highlight at the Observe booth. Moms and kids will be given the opportunity to interact with the talented kids and experienced teachers, and get to know them better, especially on how these artists have developed their talents through the years, and what child experts recommend to parents to help nurture their child’s talents. At the Play section, interactive booths will expose children to the various performing arts such as music, singing, acting and dancing. The booth will allow kids to play with the instruments, learn and interact with other participants. Workshop facilitators will be there to help the kids explore their interests and develop them into talents. Meantime, both mothers and children will keep their hands busy at the Encourage booth. Activities such as drawing, painting, arts and crafts will allow kids to try various creative tools such as crayons, paint and clay, side by side their mothers who will serve as their guides. Parent-kid tandems who participated in all three activities will definitely be rewarded with a special Promil Pre-School i-Shine gift pack which contains a kiddie backpack and free Promil Pre-School. They would also earn the chance to win exciting prizes coming from Promil Pre-School’s partner establishments in the raffle. Both mothers and kids will certainly enjoy as they both unravel and develop talents at the Promil Pre-School i-Shine Talent Camp in the following malls: Trinoma Mall (March 13 to 14), EDSA Shangri-La Mall (March 20 to 21), NCCC Mall Davao (March 27 to 28), and Ayala Center Cebu (April 10 to 11). Promil Pre-School, a powdered milk drink for children 4-7 years old, partners and supports all parents in developing their child’s talent. It contains Nutrissentials – a unique combination of essential nutrients to help optimize a child’s full potential. Watch out for other Promil Pre-School activities throughout the year as you observe, play and encourage your child’s full potential.